Grace and peace to all of you from God our Father and our Lord and Saviour Jesus Christ! Today we are looking at Jesus cleansing the temple and at His conversation with the Jews when they asked Him for a sign. This is a very interesting event. And it raises quite a few questions. We’ll try to answer at least a few of them and to see how it helps us to hear what the Lord speaks to us today. One of the questions that we’ll look at is this – what was Jesus against or what was He for when He cleansed the temple? Second question that we need to ask is about this conversation when the Jews asked for a sign. Why did they do it? What was a point for them to ask for a sign and what does Jesus answer tell us? Let’s start with the cleansing of the temple. Why did Jesus do it? What was His purpose for doing it? We may be rather quick to say that He saw so much injustice or corruption going on in the temple that He was upset about it. Really? Where can we read about it? Is this what the text says? No. So, there is no reason for us to assume that these people in the temple were doing something wrong. Sure there were “those who were selling oxen and sheep and pigeons, and the money-changers sitting there.” But, why would this be wrong? We need to understand what was going on during these big festivals in the temple. There were tens of thousands of people visiting Jerusalem and wanting to offer their sacrifices and also to pay temple taxes. They came from different places, some of them from far, far away. They came from places with a different currency. What do you do when you arrive in a foreign country? Today it is not a big deal because we use cards for our payments. But just a few years ago that was the first thing you had to do in a foreign country, to exchange money, to buy a local currency. Someone had to provide this service for those who came to the temple. For the sake of good order and convenience this service was offered in the temple and under the oversight of the temple authorities. This was much needed and legitimate establishment. Sure, whenever there is money and chances to make an extra profit, there will be people who will take these chances. But this doesn’t seem to be the main reason that caused Jesus to drive everyone out. What about all these animals and birds? Again, it is quite simple. All of these people wanted to offer their sacrifices. That’s why they had come. But the requirements for the sacrifices were very strict. They had to be without a blemish. Perfect sacrifices for the Lord. How can you bring your perfect sacrifice if you travel from afar? It was almost impossible. Therefore that was one more much needed a service provided by the temple authorities. Anyone who came to the temple could easily buy whatever they needed. Who wouldn’t appreciate this kind of convenience? In the same place you could get all you needed, money for the temple tax and animals and birds you needed for your sacrifices. There was nothing illegal, or you can say there was nothing wrong with what they did. All of these practices were established for the sake people who came to the temple. Why then Jesus did what He did? We need to take a look at the temple’s architecture. There was the holy of holies, or the most holy place. Then next to it there was the holy place. Then there was so called priestly court, only for priests. Then there was a court for Jewish men. Then there was a court for Jewish women. Then there was so called Gentile court. That was by far the biggest court surrounding all others. Can you guess where all the money changers and those who were selling oxen and sheep and pigeons were located? Of course, they all were doing their business in the Gentile court. What did it look like? Did it look like a place where you can go to pray to God? You all have been in shows. When you go to big ones like Adelaide show you may get exactly the right impression what this Gentile court look like. Lots and lots of animals, making their noises and their smells, between them many tables with money changers. Lots and lots of people making their purchases. That was the place where the Gentiles could come to the Lord. There was no place for a quite prayer, for the rest in God’s presence. Only this huge marketplace with all the activities going on. What Jesus was upset about was not selling of animals or exchanging money in itself. It was about the fact that all these, in a way needed activities, had put a huge obstacle in the way of those Gentiles, who wanted to worship the true God. We can say that when Jesus was cleansing the temple it was not that much about driving them out of the temple as it was about making a room for those who were looking for the Lord. That was about making a room. The Lord of the temple was making a room for all the people who were seeking for Him. The Lord had established the worship so that He can come and be among His chosen people and bless them. That was the purpose for the worship. That still is the purpose for our worship today. It is not about what we do, but about what the Lord does for us. That’s why it is called the Divine Service. That’s Him who serves us, we are simply receiving His gifts. So, what does it mean that He was making a room for those who were looking for Him? As we discussed there where different courts in the temple, and only certain people could enter them. Only certain people could get closer to God. If you didn’t happen to be one of those certain people you could only watch things from afar. Sometimes people still think this way about the Church. That only certain kind of people can come before God. And sometimes churches may act this way. 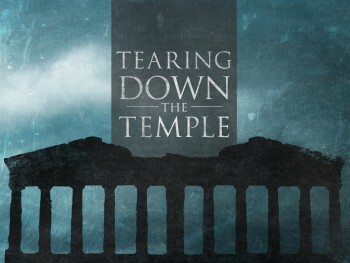 What Jesus did with the cleansing of the temple in a way symbolizes His mission. He came so that everyone can be as close to God as possible. Everyone. This is what Jesus offers you today. For Him it doesn’t matter what you are, what you have done, where you come from, or what your past looks like. It doesn’t matter. He is not looking for certain kind of people. He invites everyone to be as close to His as possible. Come to me! We can quote the apostle Paul saying ‘there are no more Jews or Gentiles, there are not more men or women, there are no more slaves or free’. We could add that there are no more worthy or unworthy, there are no more clean and unclean, no more good people and sinners… And so on. There are no more distinctions which would keep someone away from God. In Jesus everyone has access to God. Everyone! It doesn’t matter what you think about yourselves. It doesn’t matter what others think about you. What matters is what God thinks about you. In Jesus you are a beloved child of God. Each of you unique. Each of you with your own wounds and guilt. Each of you loved as God’s true child. This is why Jesus came. To open you doors to the Fathers house. To make it your home. Have you heard that people accuse Christians that we are exclusive? We may feel bad when this is said. It is such a nonsense. You could say that Christ’s Church is the most inclusive place, it is a very definition of inclusiveness. For there is not a single one who wouldn’t be welcomed. There are no more outcasts, there are no marginalized, there are not those who are not good enough, who still need to improve before they can come before God. There are no requirement to come to God the Father through Jesus Christ. You see, in all belief systems, religious or non-religious, there are some kind of standards. In some of them more, in some less. But there is always something you need to do, or be, or achieve, or observe. If you match these criteria, then you are fine. And there is only one place which welcomes everyone. That is the Church of Jesus Christ. Come, for you are invited! Come, for God is waiting for you! No merits required. Not a clean past. Not a perfect life. No requirements at all. And if you come, the Kingdom of God is yours. You are made a child of God, a member of the divine family. All that is required is simply – to receive what God the Father offers you through Jesus His Son. Yes, but someone can say, yes, but you exclude all other belief systems. You just want to impose your own. You just want to believe that you are the only ones who have got it right. You just want to have all authority for yourselves. Fine, let’s think about it. Have you wondered, how can we know that we have got it right? This is exactly our second question. This is exactly what the Jews asked Jesus. When He cleansed the temple, it was obvious that what He did no one else could do. That’s why Nicodemus said that they knew that no one could do these signs unless God was with Him. Or, unless He was God. The question that the Jews asked Jesus wasn’t a stupid question. See, they were responsible for the temple. This responsibility was given them by God. Now, some carpenter from Galilee comes and drives everyone out. What they essentially were asking was a simple question. In whose authority do you do it? Can you show as a sign that would confirm your authority? Moses was able to show how his stuff turned into a snake and how his hand became white from leprosy and then healthy again. What is your sign? It was common in the Old Testament times to expect from a prophet immediate signs which would prove that his message had divine authority. So is a way it wasn’t unreasonable question. Show us something that we could believe that you really are acting in God’s authority. This was the same that the people ask today. Show us why should we believe this Jesus! Show us some kind of sign, then… and we can’t. And we don’t have to. They saw it with their own eyes. They witnessed it and … did they believe? No, they tried to tell that Jesus is doing it all in the power of Satan. If you don’t want to accept true God when He comes to you, you’ll always find some excuses. What did Jesus answer? “Destroy this temple, and in three days I will raise it up.” Destroy this temple! Destroy this temple of God, where the whole fullness of deity dwells and I’ll raise it up. Of course, He was speaking about His own body. He was speaking about His resurrection. That was Jesus answer. I’m not going to show you anything less. I’m not going to show you some dubious signs which you could then doubt or explain away. I’ll show you just this one – my true power. The true source of my authority. I’ll show you who I am. I’ll show you that I have power not only over entire creation, but also over death. Over this ultimate enemy whom no one can escape. He did exactly what He promised. He rouse from the dead, in three days, to validate that He had authority to do what He did and to say what He said. That He was indeed the Son of God, that He is indeed to only way to the Father. This was Jesus answer to the Jews. This is also our answer to those who don’t believe. Jesus resurrection. If He rouse again from the dead, and hundreds of eyewitnesses saw it, then He has proven that what He said is true. If it is so, we have the most inclusive, the most loving God that anyone could imagine. The one who came Himself to bring you to the Father. You have God who invites you as you are and where you are. You have God who is so generous that He wants to share with you all that He has. This is what we can learn from this unusual event. That Jesus has made a room for each of you. And this your room is in His Father’s house. Nothing is required. All that you need to do is – to receive it. Just receive it!